See which author shortcode is best to use for authorship in this quick video tutorial. Plus, I’ll show you the trick of where it gets its info, and how to set that up properly too in your User info. 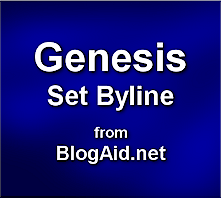 The Genesis 2.0.1 update fixed the minor bug with the byline shortcode I reported earlier. And, in the process of researching what was shown with all the different shortcodes, I discovered something shocking. WordPress leaks your login username all over the place. In the video, I show you an example, along with tips about how to protect your WordPress login.